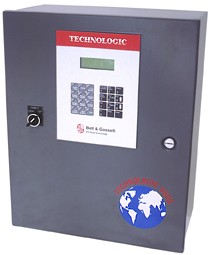 The Technologic 5500 pump controller is designed to provide optimum performance, reliability and energy savings. Receiving sensor inputs, staging pumps, controlling AFD speed and monitoring the motor performance to meet system demands are the overall functions of the pump controller. The Technologic 5500 Controller combines PID functions, setpoint modification, and system and component status into a single, central, user-friendly unit. A data-logging feature provides historical information of key events with date and time stamps. Log information includes alarms, pump run timers and pump cycle counters. The signal log displays the minimum, maximum and current values of the process variable and flow. It is also capable of displaying kilowatt-hours. The Technologic 5500’s flash memory permits customized settings to be loaded and saved. These field values are permanently retained even after corruption of data due to external disturbances. The Technologic 5500’s modular design adds unlimited flexibility as it incorporates years of Xylem Bell & Gossett engineering development and programming into a state of the art control system designed exclusively for pump applications. Microprocessor based dedicated pump controller for variable volume pumping systems. The control panel consists of the following components: microprocessor, operator interface with 4 line display and membrane key pad, and 24 VDC power supply. Multi-pinned connecting cables for connection to bypass panels are available as options. See the control panel nameplate for operating voltage, current draw, as well as information on the equipment to be connected to the control panel. Commercial HVAC and pressure boosting applications.